Amplifying and mobilizing moms and dads across the nation around healthy kids and communities! Children consume a significant portion of their daily calories at school; when schools have healthy foods and beverages in cafeterias and vending machines, children eat better. MomsRising is supporting work around PE and recess, Wellness Policies, marketing in schools, and access to safe drinking water. Companies spend almost $2 billion / year marketing food to our kids, often when parents aren't around through text messages, games, character endorsements, school materials, and more. 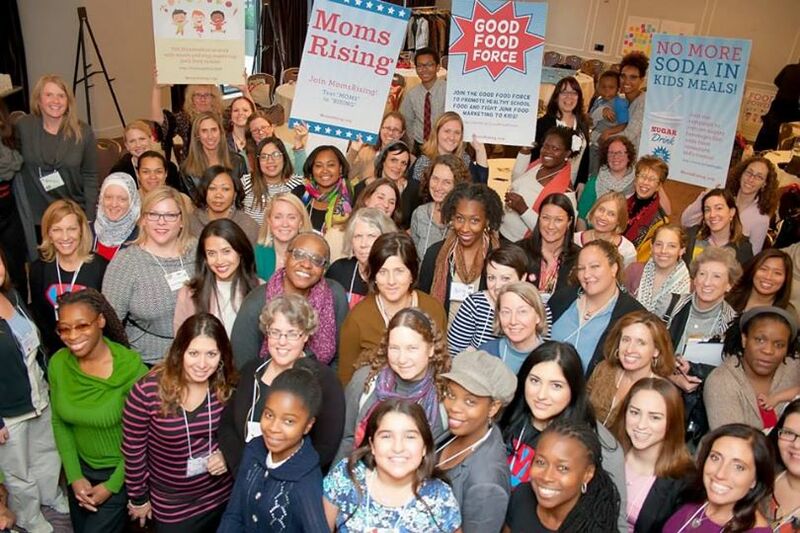 MomsRising is targeting companies like Walgreen's and Nickelodeon, insidious practices like digital and targeted marketing to communities of color, online privacy, and important mechanisms like the Corporate Food and Beverage Advertising Initiative. Suspensions & Exclusionary School Discipline Policies Three million students, including preschoolers and kindergartners, are suspended from public schools each year across the nation. This harmful practice begins the school-to-prison pipeline. Youth Incarceration:The experience for a child entering a youth prison is similar to the experience of entering an adult prison. Incarceration is traumatic, hurt kids, breaks up families, and leads to lifelong challenges for all affected. In addition, many children face challenges getting access to safe drinking water. From the school to the home, available, clean water is a priority. MomsRising has succeeded in getting major fast-food restaurants like Wendy's and Burger King to remove soda as the default option in kid's meals. This year we're also working on soda taxes and labeling, water quality and testing in schools, and breastfeeding. ALL HANDS ON DECK! Parents and community-members like YOU have tremendous power. Join the 4KidsRising Facebook Group and follow the conversation on Twitter via the #4KidsRising hashtag. Join our popular tweetchats including #FoodFri (every Friday 1pm ET), #WellnessWeds (Wednesdays 2pm ET), and #EarlyEdChat (Thursdays 2pm ET). Connect to others in your community interested in taking action through our #KeepMarching circles! Check out videos from our Food Power! Conference in Brooklyn, NY, including a special welcome from First Lady Michelle Obama!